I was once working in a building that was under construction, and the noise was so loud and annoying that I said it was like someone playing a trombone — badly — inside a swimming pool filled with gravel. I made a simile, because the English language is capable of comparing things to other things that might not exist. Imagine you couldn’t do that. Imagine that, to make said comparison, I would have to have a bad trombone player buried in a huge pile of gravel on the floor of a swimming pool, playing his instrument all the while. 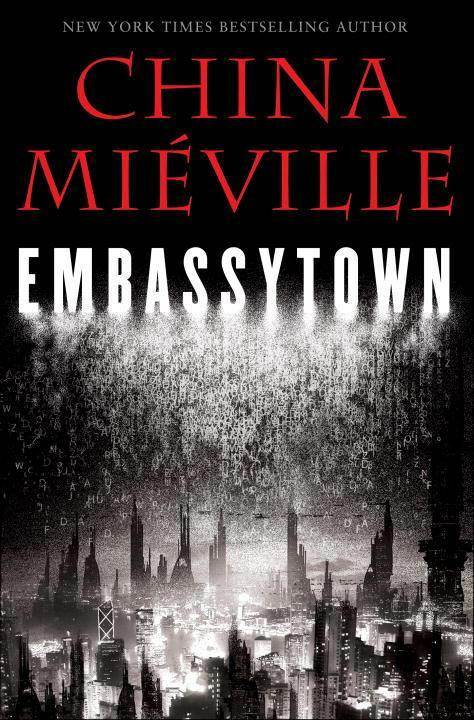 The main character of China Mieville’s newest novel, Embassytown, is that trombone player. Embassytown takes place in the far future, on a planet called Arieka. The natives — colloquially called Hosts — can breathe human-compatible atmosphere (although the reverse is not true), so they created an area on the planet for humans to settle in, so we could trade with them. The world of Embassytown is exactly as phantasmagoric as you would expect from Mieville. Hyperspace travel goes through a weird realm called the immer where people see… things. The Hosts are a cross between spiders, flies, and two-mouthed hydras. Humanity has created Ambassadors to speak with the Hosts — twin humans, connected by mental implants — who act as one person (despite being two discrete beings) and can speak Language, the Hosts’ form of speech, which is delivered via two separate streams of words at the same time. And, of course, since the Hosts can’t compare things that never existed, in order to create similes they have to use humans. Enter Avice, the main character, who — in Language — is “the girl who was hurt in the dark and ate what was given to her”. To create that simile, Avice actually had to undergo the events of it. So did dozens of other humans, such as “the man who swims every week” and others like him. Embassytown follows Avice, who grew up in Embassytown and left home to become an immerser — someone who can pilot starships through the immer — but has returned to Arieka a minor hero, not just because of her facility with immersion but also because she is one of the most popular similes among the Ariekei. Spurred on by her (non-exclusive) husband’s desire to learn Language, Avice inveigles herself in high society, eventually forming a relationship with Ambassador CalVin and appearing with them at parties and functions. But one day, when a ship from Bremen (home planet of the confederation of worlds that includes Arieka) delivers a new Ambassador, EzRa, the strange world of Embassytown and the Ariekei who frequent it is changed forever. Like all of Mieville’s books, Embassytown is full of rich imagery, unique patois, characters you both love and hate, and strange and wonderful creatures. In this book, the mind that gave us New Crobuzon’s Remade presents the Ariekei’s technology — all bioengineered, all alive, from aeoli (breathing masks that convert Arieka’s air into something humans can breathe) to guns that spit their ammunition in the direction they’re pointed. Even buildings are alive, to a point. But Embassytown‘s Big Idea is language: what is it, how is it spoken, and how does it differ when you can’t even create a metaphor because your brain would literally force you to go insane? The Ariekei can’t lie because Language is a completely referential language. They don’t even have the word “that”, because when you say “that chair”, you not only refer to the chair at which you’re pointing but also implicity every other chair in existence as being “not the one I want you to focus upon”. Despite its broad scope — language, politics, aliens, bioengineering — the novel echoes a common theme in Mieville’s other books: the love of one’s home and the desire to protect it. From Uther Doul and the Lovers in The Scar to Inspector Borlu in The City and the City, Mieville often focuses on a character who cares so much about his or her home city that s/he is willing to do anything to save it — go against the government, oppress the people, break the law, betray loved ones, and even commit murder. And, really, that sentiment is very deeply felt by many who have moved away from the place they consider “home” — for example, I still refer to Fort Lauderdale as “home”, even though I live in Atlanta now, and my memories of “home” are pretty much uniformly good, even though stuff happened to me while I lived there that I certainly wouldn’t want to experience again. Similarly, while Avice didn’t have a charmed childhood, and while she does harbor some animosity toward Embassytown, she clearly loves the place and doesn’t want to see anything bad happen to it. And, since she’s a little bitchy through the first quarter of the book, that sort of thing really does help. Unlike Kraken, Embassytown doesn’t force the reader to perform mental gymnastics to keep up with Mieville’s use of language. However, the book did take me quite a while to get through. There’s a lot to absorb, and a lot of pages to do it in, and, quite honestly, for the first half or so I really wondered what the dramatic tension was going to be. If the book has a failing, that’s it — that I had absolutely no idea where the road would take me, but damn if the scenery wasn’t worth staring at, slack-jawed and awed. Embassytown is a great book. You should read it. It’s another home run by an author who seems to hit nothing but. But, you know, if you’d rather become part of a simile and be referred to as “the person who chose not to read the novel called Embassytown“… that’s up to you. Note to Parents: This book contains violence (including self-mutilation), adult language, adult situations, and occasional sexual situations (many not of the male/female two-person variety). It should be safe for older teens who have read similar material in the past. However, the reading level of the material may preclude even mature younger teens from fully appreciating the novel. Of course, you should use your own best judgment where your children are concerned.